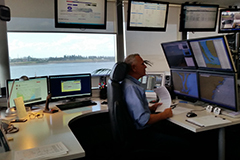 Port Authority of New South Wales’ Newcastle Harbour Master has powers under the Marine Safety Act 1998 to direct and control the time and manner in which any vessel may enter or leave Newcastle Harbour. These directions are contained within the Port of Newcastle Ship Handling Guidelines. In order to ensure the Ship Handling Guidelines are adhered to, pilots and Port Authority employees need to refer to a range of static and dynamic data regarding port conditions, river conditions, promulgated depths and various environmental conditions. Newcastle Harbour is a working harbour that is shared with recreational craft. Recreational users of the port area need to be particularly aware of the water-side restricted security zones in place near the port facilities and around trading ship movements. These zones are in place to ensure that a safe distance is maintained from shipping operations. Recreational vessels must not impede the passage of commercial shipping which is constrained to navigating within the shipping channels or swing basins. Newcastle Harbour is a compulsory pilotage port. 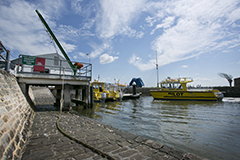 Pilot transfer at Newcastle is carried out by two methods, either by helicopter (80%) or by pilot cutter (20%). Some vessels are not suitable for helicopter transfer. Helicopter transfer can be achieved on all vessels except tankers, some container vessels, and vessels where there is not a clear circular area of 20m, or where weather restrains the ability of the helicopter to fly. Due to weather conditions, planned helicopter pilot transfers may change to pilot cutter at any time. A pilot cutter is used for the remainder of transfers. In this case the pilot climbs the ships ladder up to 9 metres in height. All vessels engaged in pilot transfer should monitor VHF Channel 06 for instructions from the pilot. It should be noted that any vessel that has defective pilot boarding arrangements will be declined pilotage and the Australian Maritime Safety Authority (AMSA) will be advised of any deficiencies. Once aboard, the pilot conducts a Master/Pilot information exchange briefing to provide the bridge team with all the necessary information required to conduct a safe pilotage. The pilot uses VHF radio to communicate orders to the tugs, which are used to aid the manoeuvre. All vessel movements are booked by the vessel agent through the Port of Newcastle Operations Pty Ltd Operations Ltd vessel schedulers. Australian Maritime Safety Authority (AMSA) Marine Orders Part 21 (Safety and emergency arrangements) paragraph 12, which implements Australia’s obligations under the International Convention for the Safety of Life at Sea (SOLAS) Chapter V Regulation 23. The pilot ladder to be constructed and rigged in accordance with above. The ladder should be clean, properly fitted with spreaders, well clear of all discharges and outlets and any shipboard fittings that may foul the pilot cutter. The ladder should be rigged with the bottom step 2m above the water. Where a combination ladder arrangement is required, the accommodation ladder must be secured to the ship’s side, leading aft. The lower horizontal platform should be at sufficient height above the water to prevent the pilot cutter or pilot becoming fouled during the transfer. Manropes are also to be provided for combination arrangements. Two (2) clean manila manropes of not less than 28mm diameter and not more than 32mm diameter are to be securely made fast to the ship. The manropes should be the same length as the ladder. Where the ladder is rigged over a bulwark, two (2) stanchions are to be securely fitted to the top of the bulwark, one on each side of the ladder, with steps provided from the bulwark top to the deck. A heaving line is to be provided for the pilot’s bag. At night the ladder is to be well illuminated, the light pointing forward. Tripping lines for ladder retrieval should not be fitted. A ship’s officer should be in attendance at all times and have radio communications to the bridge. All appropriate safety equipment should be available at the ladder. The Master or another officer on the bridge should be monitoring the transfer from the bridge wing. The pilot will normally liaise with the Master to ensure the correct ship heading for safe transfer. Normal ship speed for pilot transfer is approximately 8-10 knots. 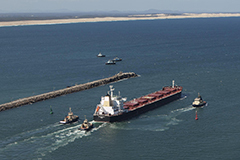 Port Authority of New South Wales – Newcastle reserves the right to delay vessel embarkation of a Marine Pilot until these requirements are fulfilled. Further, all instances of non-compliance will be reported to the Australian Maritime Safety Authority. Note: To further assist in proper securing of a pilot ladder in accordance with these requirements, there are commercially available products available. 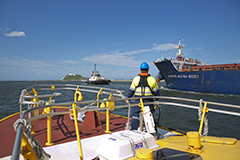 An example of a product used in other ports in Australia is the JMAC Marine and Industrial “Blue Box” and “Yellow Mag” Pilot Safety devices. These products are designed to assist in securing of a pilot ladder if the freeboard of the vessel exceeds 9 metres as per SOLAS and IMO regulations. Whilst the use of this specific equipment is not mandatory, there is far greater probability a pilot will be able to embark / disembark from or to a vessel without incurring unnecessary delays with the employment of such a system. Vessel to comply with Marine Notice 2016/09. Vessel to comply with Marine Order Part 57 (Helicopter Operations). Maximum weight of helicopter is 1361kgs (Hughes MD500). The weight of the helicopter and skid contact area on the hatch lid result in point loading on the hatch less than 200kg/m². This hatch lid loading is minimal and far below allowable design maximum loadings of the hatch lid. If in any doubt the Master should seek clarification from ship’s drawings, Owners or Class Society. Vessels that are fitted with timber stanchions to have at least 17.5m clear between stanchions with no other obstructions present. At least 20m clear all around when helicopter is on the landing hatch. Any ship cranes to be in the stowed position and secured in the cradle and hooks lashed and secured. No loose objects to be in the vicinity of the landing hatch. Crew members are not permitted on the landing hatch during helicopter operations (see link below). Emergency fire party to be on standby upwind of landing hatch with all appropriate safety equipment available and fire main pressurized. Emergency rescue party to be ready at the rescue boat. Safe access provided from the landing hatch to the deck, including properly secured ladder and hand holds or stanchions as appropriate. The pilot will normally call the vessel prior to landing to advise the Master of the correct ship heading for safe transfer, to confirm the landing hatch number and that all emergency crews are on standby and the vessel is ready to receive the helicopter. In poor visibility and at night, all deck lights to be switched on. NB: Vessels that are fitted with cranes and timber stanchions utilising helicopter transfer and have not previously called at Newcastle, normally the first pilot transfer will take place by pilot cutter until the pilot has assessed the vessel for helicopter compliance.